Wikinvest generated a lot of buzz a couple of weeks ago when it announced a platform that lets users track their investments at brokers in real-time. If you are not familiar with Wikinvest, it works kind of like Mint.com, which tracks transactions in my bank accounts, but what Wikinvest tracks are investments at brokerage accounts. Basically, it aggregates all your holdings at your broker accounts that it supports and shows performance of your investments on one single page, so you don’t have to log into each of your account to see how your stocks are doing. The concept wasn’t entirely new. I had a brief encounter with Covestor in the past. What Covestor does is also gather your investments at brokers then share the portfolio with peers, which is a little different from Wikinvest. I waited a little bit to test Wikinvest out, but I am quite disappointed from what I got. Not sure whether it’s because the service is still very new or not. Setting up an account with Wikinvest is very simple. All I need are an email address, a user name and password. No other personal information is required. 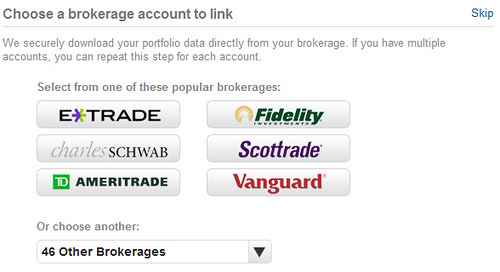 After creating the account and logging in, I got a screen where I can select broker accounts to link to Wikinvest. As you can see from the above screenshot, a total of 52 brokers, including some well-known names such as Fidelity, Vanguard, and Schwab, are currently supported by Wikinvest. However, since all my stock investments are at discount brokers, I was looking for Scottrade, TradeKing, Zecco, Firstrade and OptionsHouse, etc. Unfortunately, not all the discount brokers that I have an account with are supported by Wikinvest. In fact, I only found Scottrade, Zecco, and optionsXpress from the list of brokers that can be linked to Wikinvest. If you are also using discount brokers, your may not be able to link your account to Wikinvest due to the coverage issue. After selecting the broker (Zecco for instance), the next step is connecting the brokerage account with Wikinvest, which is done by logging into the account within Wikinvest (broker account information such as account number, login ID and password may be required depending on the particular broker). I tried to link both Zecco and Scottrade. For each account, I got an online confirmation that the operation was successful after I entered required information. However, only one email confirmation for the Zecco account was sent to me, not the Scottrade account. When I went to the Summary page to account details, I only saw my holdings at Zecco and there was nothing under Scottrade. On the Portfolios page, where all the linked accounts are listed, it showed the the time stamp when the Zecco account was updated, but the Scottrade account was never updated, even though it said the account was successfully connected. I tried to delete and re-link the account a couple of time and got the same results every time. I then tried optionsXpress and was successful. But the problem didn’t stop here. Four days after I tried to link my Scottrade but failed, I got an email confirmation from Wikinvest that the account was successfully added. However, after I logged in, this was what I saw instead. Not only I didn’t see the Scottrade account, but also the two, Zecco and optionsXpress, that I have added before were all gone. There isn’t any account in Wikinvest. Well, maybe Wikinvest is a good idea that lets its users to track all their investments at one place. But until it fixes the bug, I don’t think I will waste any more of my time setting up the accounts then losing them later without any reason. My concern with these aggregating tools is that you’re ultimately putting faith is the service to securely maintain your account information. Mint is one thing, but access to your entire investment portfolio kind of gives me the heebie jeebies. Their UI looks pretty good though, so if I could ever bring myself to trusting such a service, I could definitely see the merit. I do see the valid merits of using this service, but I need more “proof” to feel the full confidence in totally trusting this service provider with all of my investment information. Thanks for your review. i just received email from wikinvest telling me how my investnents are doing, tell me please who the hell are you, and what right you have to go into MY private files? Monday I received email from you ! Regardless of what is promised, I think you have to be foolish to enter your username and password to your brokerage accounts. This is a hackers dream. There are plenty of software programs that you can place on your computer and track your investments in real time, without making it available to the whole world.